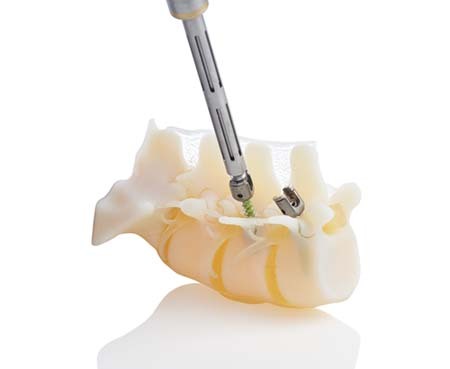 True–to–life anatomical structures: A pedicle screw driven into 3D printed model of a patient's spine. MINNEAPOLIS & REHOVOT, Israel–Stratasys recently unveiled BioMimics, a highly advanced capability to 3D print medical models that are engineered to meet demands of the industry's leading hospitals, researchers, and medical device manufacturers. 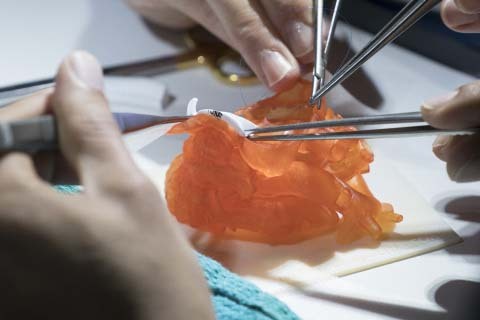 Offered initially in North America as a service through Stratasys Direct Manufacturing, BioMimics is reported to provide highly realistic, functionally–accurate 3D printed replicas of complex anatomical structures that can empower more effective medical training, education, and advanced device testing. According to a press release from Stratasys, BioMimics eliminates restrictions associated with training, research, and testing on animal, mannequin, or cadaver models, and thus effectively mirrors the intricacies of soft tissue and hard bones via multi–material 3D printing. Combining Stratasys's PolyJet 3D printing technology alongside new materials and software, organizations can create specific 3D printed models that match what professionals encounter during live medical scenarios. Additionally, OEMs can gain real–time feedback on device performance in realistic environments, prior to actual deployment. "Testing innovative medical devices, teaching principles of surgery, providing continuing medical education, and demonstrating new products to clinicians all require 'bench–top' models that simulate human bodies and diseases," said Scott Rader, general manager of Healthcare Solutions at Stratasys, in the release. "Much like simulation and co–piloting builds expertise for pilots, medical practitioners hone skills throughout their careers to provide exceptional care. The challenges of today's solutions include animal models that only approximate human anatomy, and cadavers that don't retain the live–tissue feel and often lack targeted pathology. "BioMimics is a revolution in medical modeling, capitalizing on advanced 3D printing techniques for clinically accurate representations of complex human anatomies–from microscopic patterns of tissue to replicating soft to hard texture of body structures," Rader continued. "Armed with unmatched realism of BioMimics, researchers, educators, and manufacturers can finally utilize the tools to prove out new ideas long before clinical trials, and demonstrate innovations to the skilled physicians who rely on them." BioMimics is available today in North America through Stratasys Direct Manufacturing (www.stratasysdirect.com). It is initially designed to model the complexities of heart and bone structures, with vascular anatomies expected in early 2018. Engineered alongside the industry's top researchers and manufacturers, the service is said to empower customers to either capitalize on a variety of existing BioMimics models, or design enhanced anatomical structures that match distinct clinical requirements. "The Jacobs Institute has been using Stratasys 3D printing solutions to replicate vascular anatomy for many years," said Dr. Adnan Siddiqui, chief medical officer at Jacobs Institute and vice–chairman and professor of neurosurgery at University of Buffalo Neurosurgery. "The BioMimics capabilities Stratasys has now developed enable a level of biomechanical realism and clinical sophistication not previously available in any vascular model. BioMimics will enhance medical innovation in vascular disease by enabling improved pre–clinical validation of new devices and clinically realistic training simulators." "As one of the top research and pediatrics hospitals in Canada, SickKids is committed to unprecedented innovation to positively impact the well–being of children around the world," said Shi–Joon Yoo, M.D., Ph.D., cardiac radiologist at the Hospital for Sick Children and professor of medical imaging and pediatrics at University of Toronto. "We have developed new training programs through 3D printing that allow surgeons to practice procedures on replicas of real patient's pathology. BioMimics enhances the realism and clinical validity of the models even further–allowing the surgeons to develop the techniques and skills that will translate into live patient cases."